Formal top and bag from night market; slack from Melange; hairclip from Diva. Hair plaited by Ser Lyn. Last Friday and Saturday were spent helping out with my university convocation. My friend helped me to braid the side of my hair as I was involved in mini performance with a few other people - singing my uni anthem. (: We had to dress up formally for it was a strictly formal event and I had to borrowed an oversized blazer from a guy friend due to last minute notification. You need a tutorial! This is a cute hairstyle! 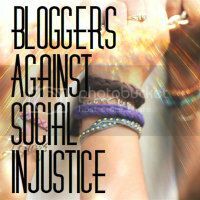 Btw Tiana, I would like you and your readers to come join us in fun events organized by our Bloggers Against Social Injustice committee & also at the same time do your part and spread the words of a good cause. this braid looks so cool on u !